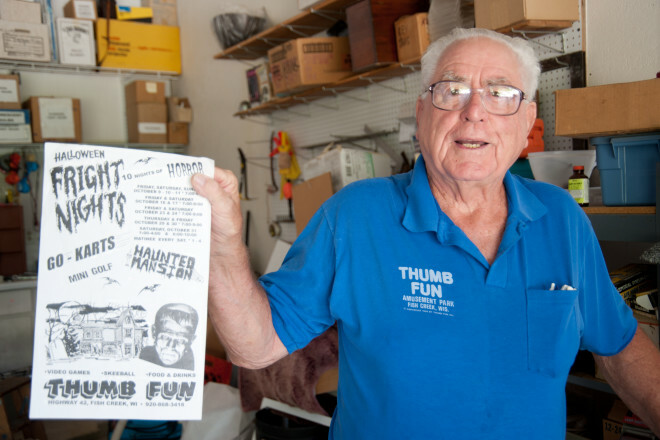 Doug Butchart, digging through some of his Thumb Fun memorabilia in 2010. Photo by Dan Eggert. To meet Doug Butchart was to meet a caricature come to life. Everything about his appearance seemed exaggerated: the huge, square eyeglasses that could have doubled as snow goggles, the bushy eyebrows that periscoped over the rims of those glasses, the shock of white hair, the tiny legs carrying a Santa’s belly and that big, guttural voice. The man was a born promoter. And promote he did. For 38 years, he was an omnipresent force in Door County, hawking the attractions of his brainchild, Thumb Fun Amusement Park. He drove a hearse through parades to market his haunted house, visited big employers in the Fox Valley to hand out coupons to families and hit up local TV and radio stations to do broadcasts from his midway. His posters and brochures were everywhere, and all winter long, his rides were dancing in the minds of thousands of boys and girls, including yours truly. Butchart, the man who put the fun in Door County, died Tuesday, Feb. 19, at Door County Medical Center. He was 88. When I interviewed him for the first time in 2010, Butchart was 80 years old and 12 years removed from the closing of his beloved amusement park, but his coffee table was still strewn with carnival trade magazines. He missed his park and talked excitedly of getting back into the business – maybe opening a new one in Egg Harbor. “He always needed to have a dream,” said his second wife, Robin, whom he married in 1999. Like Butchart’s physical features, his energy was over the top. Our conversation stretched for hours – from breakfast, to his living room, to his garage, where he still had boxes of old Thumb Fun memorabilia. That’s the way his mind worked: careening from one idea to the next, with visions and creations coming to him like birds landing on his shoulder. Butchart called the creation of Thumb Fun “a progression of errors.” He didn’t start with a vision for a big amusement park. 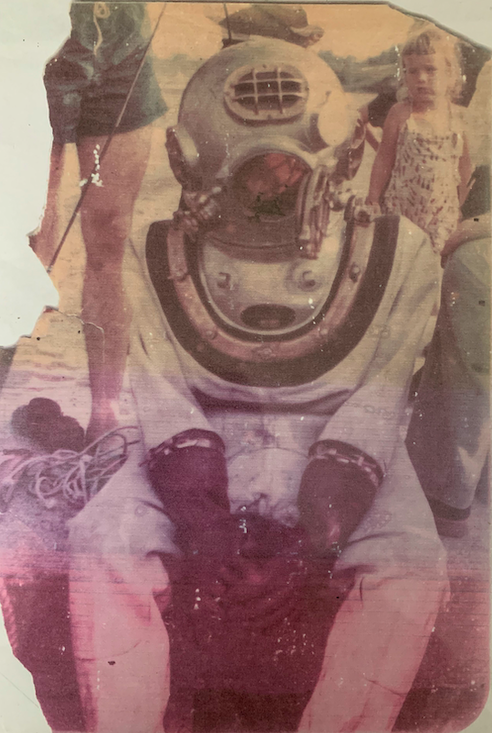 In the late 1950s, Butchart – who had served in the Army Corps of Engineers during the Korean War as a marine diver specializing in explosives – taught diving lessons in Green Bay. When people began asking him to take them diving to shipwrecks in Door County, he opened a dive shop in Egg Harbor, then moved it to Fish Creek the following year. Doug Butchart was immensely proud of his diving days with the Army Corps of Engineers. His hearing was damaged by his work detonating explosives underwater during the Korean War. Submitted. He happened to find a location that was once a driving range, and before long, the driving range was much more profitable than the dive shop. Butchart soon added mini golf, then pinball machines, and not long after, a couple of carnival rides. Doug Butchart had become a full-on carney – in the best of ways. Kids clamored for rides on go-karts, bumper boats, the tilt-a-whirl and carousel – more than 35 rides in all. Evenings brought dating couples to the midway full of games, where one could win stuffed animals or mirrors with the likeness of the heartthrobs of the day. The park grew steadily and then went nuts when Butchart hooked up with Toby Schlick and Weldon Blum to build a haunted house. 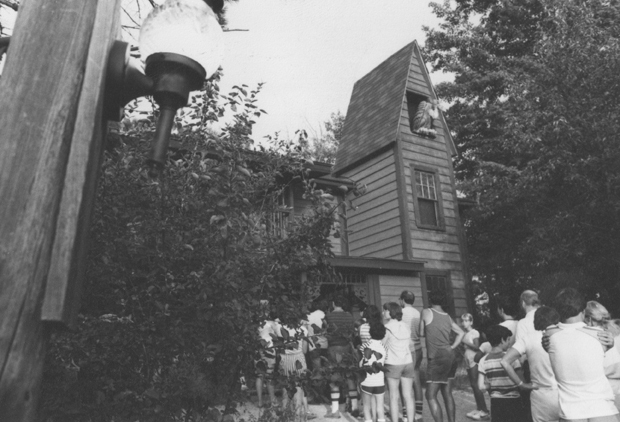 Memories of the haunted house at Thumb Fun still give people chills. Submitted. What made it work was the use of live actors – originally just people dressed in black to keep an eye on the props so kids wouldn’t steal them. Butchart was born in Evanston, Illinois, on May 17, 1930. After graduating from high school in San Antonio, Texas, and serving in the Army Corps of Engineers, he earned a degree in business from Carroll College and moved to Green Bay, where he worked as a salesman and scuba-dive instructor. But it was the thrill of business – of taking a risk and seeing whether it would pay off – that excited the man Digger DeGroot called “the Walt Disney of Door County.” Butchart loved a good prank and a great gimmick, and he put every dime he ever made back into the park. One year he added a train that wove through the woods around the park, and later he constructed a waterslide that drew criticism that he was ruining Door County. “Someone made a wooden sign and put it on the hill for the slide that said ‘Door Dells’ as a jab at my father,” Olson recalled. But Butchart persisted, building a business that drew 3,000 to 4,000 people on summer days and employed more than 70 seasonal employees, half of them housed by Thumb Fun. By the mid-1990s, however, he was nearing retirement age and experiencing health problems. He had lost his first wife, Jeanne, in a car crash in 1980, and he and his daughter, Peggy, had poured themselves into the park. “We could both eat, sleep and dream that place,” Olson said. Butchart worried that if he kept at it, Peggy would never know anything but Thumb Fun. He wanted her to have a chance at something else, so when developers approached him about buying the land for a condominium development, he knew he had to think seriously about selling the thing he had poured his heart and soul into for more than three decades. 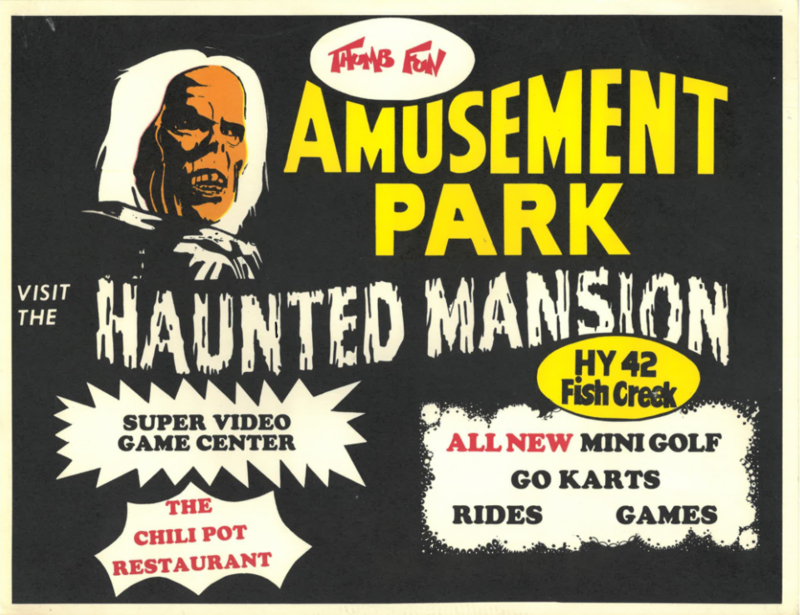 In October of 1998, Thumb Fun opened its gates for the last spins around the carousel and the final frights in the haunted house. 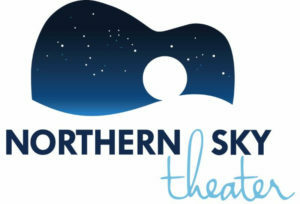 Butchart stepped away from finding, managing and housing a huge staff and got his chance to travel and to put his promotional skills to work as the popcorn man at American Folklore Theatre and for the Door County Humane Society. 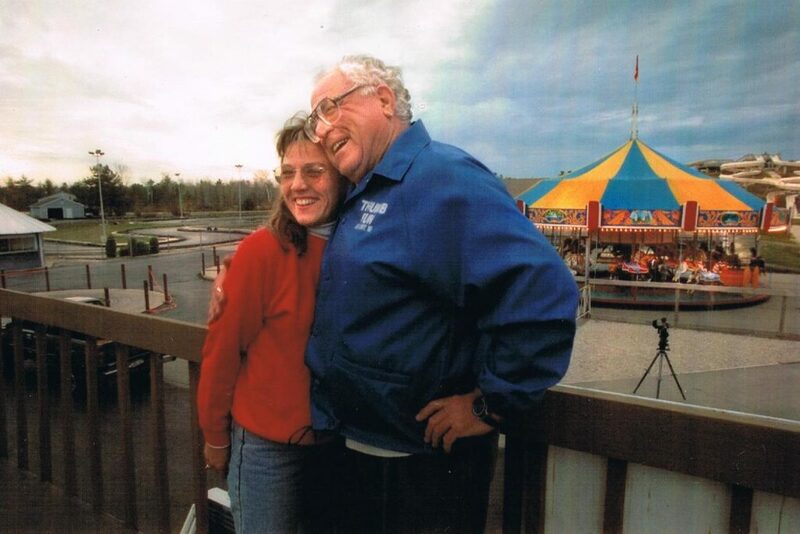 Dough Butchart with his daughter Peggy during the final day of operations at Thumb Fun Amusement Park in 1998. Submitted. “Do you miss it?” I asked.